Then look no as the PediBus has it all. Love Pop Ups London community had the pleasure to experience the City and Thames route. We all cycled together across London over many bridges and capturing great sights of London such as Borough Market, Blackfriars Bridge, The Bank of England and The Monument whilst drinking at the same time. Half way there is also a stop of at a pub for a swift pint if you wanted. All of this was done within a little over an hour capturing great sights of London. To ride a PediBus it costs £25-£30 per person for any group size. 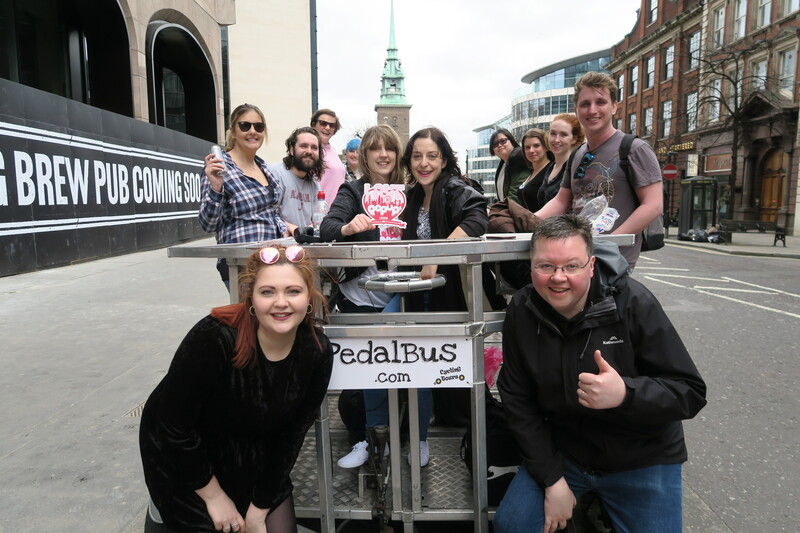 A PediBus holds 12 people in total which involves 8 cycling and 4 people standing in the VIP section. You can swap and take turns though throughout. So get ready and cycle! Love London, love seeing famous landmarks, love cycling ? So everyone has seen them crazy people who are pedalling around London to music and been like never will I do that!! Hahaha you might say… well today we did just that. We became them crazy people pedalling around London to music and sipping on wine. The PediBus is a super fun experience where you can take in the sights of London with your friends while getting fit. It’s quite hard work, as you have to pedal up banks and keep up with the traffic. I must admit, I took a relaxed approach and was on of the VIPs who stood up, taking pictures and dancing. The experience is best reserved for 8 people I would say, as it would be quite heavy and hard work to peddle with more people onboard. It’s a really good one time experience and something you definitely should do just once in your life. So come on what are you waiting, book the PediBus and be that person who is waving at the people of London and posing for pics. If you’re looking for a stiff-upper-lip, London equivalent to the chaotic European beer bikes then this is your guy. Pedibus was really good fun and the host was cheerful (and helpful) and put us at ease – even when we were crawling along Tower Bridge on a Saturday afternoon with a line of heavy traffic behind us. The recommendation was to take two pints but it wasn’t a hard and enforced rule, plus, we stopped midway to grab a pint at a pub. So, it had the potential to be a real boozy affair. This is a real fun way to spend time with a group of friends – it’s a perfect Sunday activity! Warning: if you’re as unhealthy as me then you might struggle, it’s significantly more exercise than it looks! Have you ever wanted to travel around London in an unique way and drink whist doing it? Then look no further than the Pedibus. It’s a bus/rickshaw hybrid where you can pedal whilst drinking and chatting with your friends.